Is the ID = 0.863" for 1" ThermoPex? I'd be hard pressed to see how you could move more than about 37,500 BTUH over a distance of 480 feet through that ID of pipe with a single 15-58 circulator while maintaining a 20 degree Delta-T. Or 75, 000 BTUH for the case of a 40 degree Delta-T.
With two of these circulators in series you might get up to 75,000 BTUH at 20 degrees of Delta-T.
FWIW, two circulators in series will permit you to achieve double the friction head but maintain the same maximum overall GPM's (an event which only occurs at zero friction head) as for one circulator, while two circulators in parallel will permit you to achieve double the maximum GPM's (which once again happens when friction head falls to zero) while maintaining the same maximum friction head of a single circulator. Since your particular circulators curve is actually a steeply inclined straight line which at first glance comes close to making for a 45,45,90 triangle, either method would seem at first quick glance to potentially roughly double the BTUH you can move.... I would need to think about this for awhile before definitively drawing such a conclusion though. I believe that Rob has a zone where he is running two circulators in series. I have not broke out the calipers and measured the ID of the pex, I would assume it would be the smaller ID you mentioned. As far as BTU output goes I can tell you that whatever that number is, the forest eater had no trouble. I find it hard to believe that the total output through that line could only be 37,500 BTU as that seems like it would not be able to keep my house warm. 240' of the total is return if that makes a difference but if your numbers are correct then my 220k rated boiler with a net of 80k should have not had an issue with 37,500 right? Somethings off? Ballpark 37.5K is for 20 degrees of Delta-T and 75K is for 40 degrees of Delta-T (plus there are many other valid Delta-T's). I would seriously doubt that you need 75K of output BTUH to heat your house. To get these figures I set the multiplier down to 1.1 or 1.2, with the presumption that most of the too/from run is a straight line and there are less elbows on this line overall than for most more conventional zones. If I had left the multiplier at 1.5 things would have looked far worse. The forest burner couldn't squeeze a single BTU more through this line than could any other boiler. It's high top end rating for BTU's is irrelevant here. Only the Delta-T value matters. Any more BTUH delivery would require pumping with more oomph. That's why I hinted at serial or parallel connecting two of your circulators. Last edited by lsayre on Fri. Nov. 09, 2018 7:15 am, edited 3 times in total. Larry, I'm picking up what you're throwing down! Being my system is set up as ideal as I can get it, boiler in the basement, a 1" copper pipe feeding my house heat exchanger with a relatively short pipe run instead of coming 220' through 1" PEX. I don't see a need to add another pump for out there, I only have a small modine and keeps it warm enough to melt the snow off the Bobcat and pickup. I think when I rewire the controls so the boiler will fire when heat calls, that should really help a lot. I am also looking forward to using your calculator so we can get real numbers and we will all know exactly what my boiler is putting out. I am also looking forward to using your calculator so we can get real numbers and we will all know exactly what my boiler is putting out. I believe that at some juncture I corrected myself on this. All we can determine is how many BTUH your zones are eating. We can't determine what the boiler is producing. That is, except for the case where what the user zones are collectively eating exceeds what the boiler is capable of feeding them, with the evidence for this being that its internal temperature progressively falls even though it is at max output, and try as it may, it simply can't recover. The most hopeful scenario is that we will never know what your boiler is capable of producing via encountering this sole exception. I believe the BTU/hr capacity of piping is based on the flow *within reasonable friction limits* for the size and type of pipe. You *can* flow more, but it has negative consequences on the pipe and the pumps. 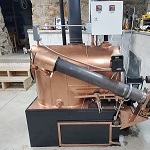 if the boiler cannot keep up with all your demands, the boiler is to small for your needs. If the boiler can cycle and your zones are not able to satisfy the Tstats, you have either a pipe size, pump size, or heat providing device (modine, baseboard, radiant heat, etc..) proplem. Now you can either “go big or go home” with your things, or maybe try to tighten up and insulate better. Last edited by hotblast1357 on Fri. Nov. 09, 2018 9:46 am, edited 1 time in total. Most of it is actually a function of the circulator. There are home heating circulators (or serial combinations of circulators) which can drive a zone up to 50 feet or more of "head", and if you divide this by 2.31 the pipe is only experiencing a maximum PSI pressure gain of 21.65 PSI as a consequence. Not necessarily unsafe when PEX is rated to handle many times higher pressure than this. But such a circulator is a huge electrical energy consumer, and velocity noise is annoying (but for the case of underground pipe no one will hear it). You are correct in that such velocities can and will wear out pipe much sooner. It won't burst, but it will decay from the inside out. If the boiler can cycle ... or heat providing device problem. If the boiler can cycle (as in recover) while under a maximum load from the users it is not the problem. That’s exactly what i said Larry.. This statement should end all conversation. Looking for that missing lottery number that does not exist. This boiler will get me by till I get one that will completely do the job! Insulation pays dividends every single day you are heating. It is #1 factor. We've found that the amount of Radiation (baseboard, radiators, etc) is the #2 factor in heating with a boiler. I knew that going in, but the extent was a pretty big surprise! Even with good zoning (another big help), there is a significant difference between running a zone for 20 mins every 2 hrs vs 45mins per hour to heat a room. If too little, by the time you've put enough BTUs into the room, it is time to start replacing what you've lost. The faster a zone can be satisfied, the more opportunity to send "full power" to other zones. Sure, they will overlap at times, but a good way to bring down a system and be cold is to have all the zones calling for heat at once. The Delta-T gets too large, recovery eventually exceeds capacity, and lower temps in the zones mean less BTU delivery and longer runtime to meet the load. Swyman, you truly need to step back and re-think this. Your old 120K BTUH input furnace (oil or propane?) has proven itself capable over the years of meeting your heating needs. So even 1 stoker on your 220K unit should at least come quite close to doing likewise. You seem to have one to perhaps several water related heat moving problems. Unless one of those stokers only feeds 4-5 pounds of coal per hour, per his 8-10 pound per hour test he first did with both stokers running..